I’d recently come upon an article that discussed the classic service industry vs. Hospitality industry debate. And like most other things in life, I concluded that they are interconnected. They support each other even though they have distinctions. And this read just reaffirmed my belief in how important customer experience has become for businesses. Customer experience in hospitality industry impacts hotel’s brand image, profitability and much more. It is for this reason that small and large hotels, the world over, have started dedicating a lot of time and resources into enhancing hotel guest experience. As a hotelier, if you find yourself often wondering how to design customer experience strategy for your hotel, you might want to start with the basics. No structure, no matter how spectacular, will survive time unless the foundations are strong. Umpteen studies, conducted across the world, have concluded that guest experience is a definite key to long-term success. Therefore, getting the basics right is paramount. Here are three basic, yet most important factors, you will need to grasp to write your hotel’s success story. Generally speaking, the more you deliver (surpass, even!) on the customer expectations, the higher the customer satisfaction. Guest satisfaction is a result of the expectations that a customer has from a purchase vs. the reality of it. It is the cumulative impact of pre-purchase expectations, the experience that they have while purchasing/availing a service as well as post-purchase experience. A certain way to enhance customer experience in the hospitality industry is to take into account their entire journey with you, and make sure you leave no stone unturned in making all of it seamless and delightful. Pre-booking, booking, payment process, check-in, stay, services and amenities at your property that they may avail, check-out, departure, post-departure- everything has to be an experience that they will remember for life. Such experiences will guarantee guest satisfaction and this, in turn, will earn you the next most important factor- guest loyalty. Customer loyalty, or in our case, guest loyalty is an invaluable treasure for hotels. To encourage this trend, more and more hotels have a guest loyalty program in place. In fact, according to this stat, 83% of highly satisfied hotel loyalty program members say they will definitely recommend the brand. This stat is not to be treated lightly because it suggests that guest loyalty can help you in creating more customers by word-of-mouth marketing. This is important as it helps you reduce acquisition cost and marketing costs. According to Bain & Co, customer loyalty leads to profits. Increasing customer retention by just 5 percent boosts profits by 25 to 95 percent. And earning your guests’ loyalty is not rocket science. We’ve discussed this topic at length on our blog here and here. This one is given since I am myself guilty of reading reviews for almost any purchase I make these days. And my guess is that we are in this together! Guest reviews are for hotels what LinkedIn testimonials are for a professional. The better the recommendations for a professional, the higher the credibility, right! 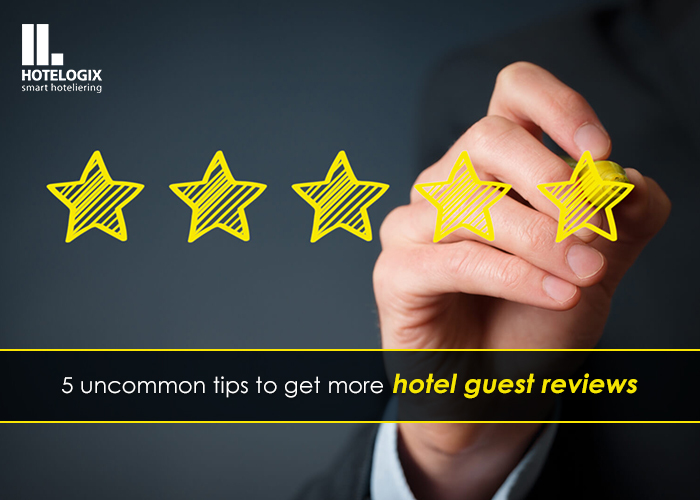 Similarly, the more the positive guest reviews your hotel gets, the higher the chances of attracting more guests. Make sure you have a feedback process in place and include multiple avenues where you can reach out to guests- SMS, email, feedback kiosk at your hotel, etc. The trick is to not just collect reviews. As much as positive reviews are beneficial to your hotel, negative reviews can also be as helpful. Take your negative reviews seriously and make sure you follow up on their feedback. Take action on the suggestions and let the guests know that you have fixed the issue. Incentivize them to come back to your hotel for a stay and make sure you delight them. Such gestures could convert an irate customer to a happy one. A positive review from an irate customer is worth so much more! Here’s a bonus tip for you to increase your guest experience. Guest engagement. By improving guest engagement, you can expect all the above three to follow. Because when you engage with your guests, it communicates to them that you care for them and that your association with them is beyond transactions. Wish your repeat guests on important occasions like birthdays, for new year’s, etc. If you add a new amenity or renovate your property, send them a mail and entice them to come pay you a visit. There are plenty many little ways and gestures which will help you engage with your guests on a deeper level. Get creative and make it genuine! In conclusion, over the past decade or two, technology has made an indelible impact on the hospitality industry. Tasks that would traditionally take hours to get done are now performed by tools within seconds. Activities that would otherwise take a whole team of staff to be managed are now automated. While technology has, undoubtedly, made life easier for hoteliers, there are somethings that can never be entirely left for machines to run- like managing and improving guest experience. For everything else that can be automated, you can count on Hotelogix cloud-based PMS. Hotelogix will be at ITB Asia 2018, Asia’s leading travel trade show. Come say hello to us at Booth number B37!